Our dog is not a dachshund. When we got him from the local shelter, we were assured a hundred times that he will not become big. He was among the hundreds of abandoned and homeless dogs in the shelter but when we picked him, he just arrived there with his brother at less than a month old. After having a large breed for more than ten years, we wanted our new family member to be less hairy and smaller so that he can be more manageable to travel with in the car and for the kids to be able to walk him, not the other way around. Every week passed and our little puppy kept on growing longer and taller that when we do encounter real adult dachshunds, they pale in size. He is now four months-old and he still keeps on showing signs of growing taller. We have already replaced his transport box to the next size, his bed, collar and leash. Yes, our small dog became too big for his size. And we learned that he is not a dachshund (not even a mix) but he is a full-bred Italian segugio, a hunting dog. And our resident segugio has the idea that he can also freely hunt on the table where I shoot all my food photos. He has already stolen tomatoes, herbs and fruits from the table while looking at me with his perennial sad eyes. I cannot stay angry with those eyes. You wouldn't too. Sigh. But let's move on to this salad. It's a favorite because it has all the ingredients that I love. 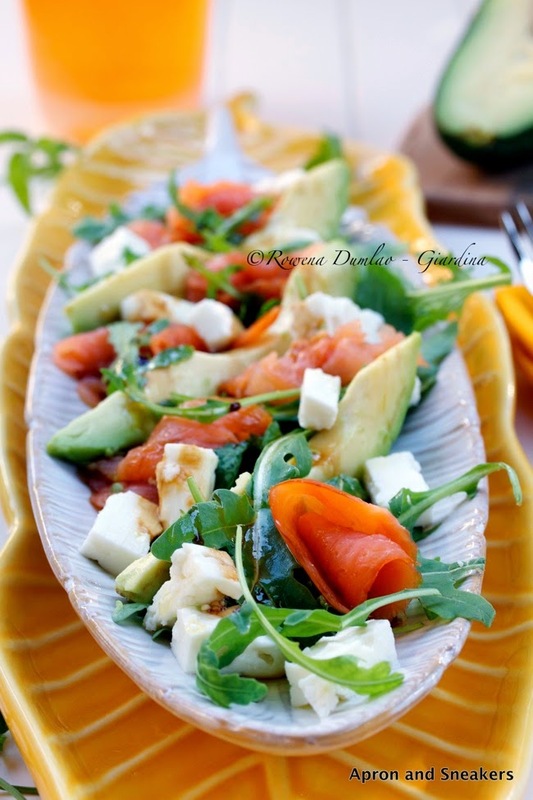 I love smoked salmon, arugula, avocado, feta and balsamic vinegar. 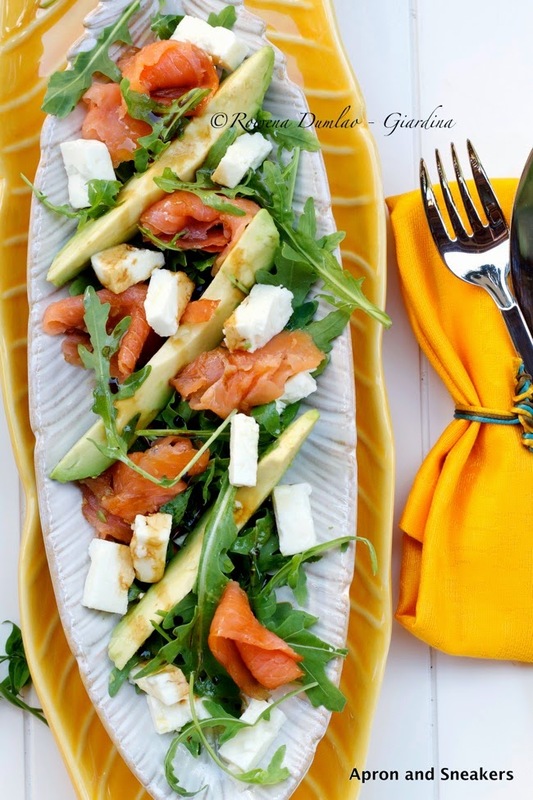 Put them together in this salad and it really is amazingly good and healthy. In fact, I can easily finish portions for two. Salmon is rich in omega-3 while avocado is one of the healthiest fruits that exist because it is very rich in oleic acid and carotenoids. 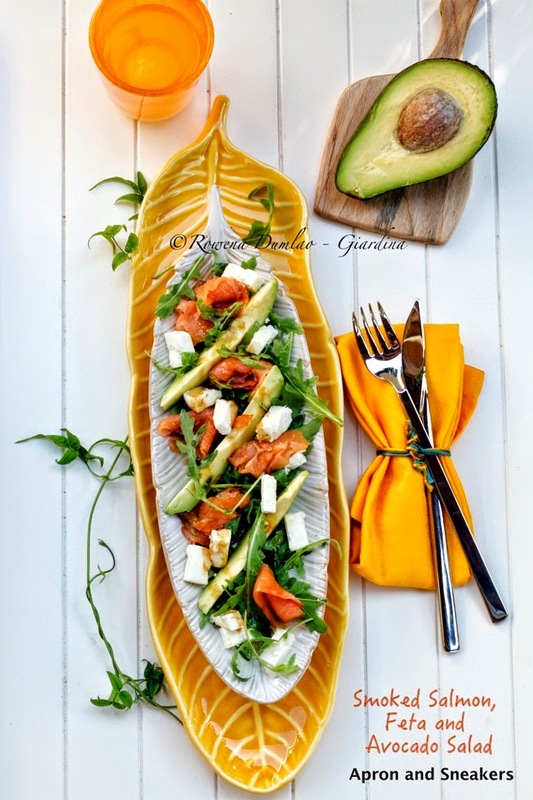 Because it is such a healthy dish, I created this Smoked Salmon, Feta and Avocado Salad recipe for the site dedicated to healthy living, Skinny Ms. Hop on to their site to learn more about having a healthy lifestyle.